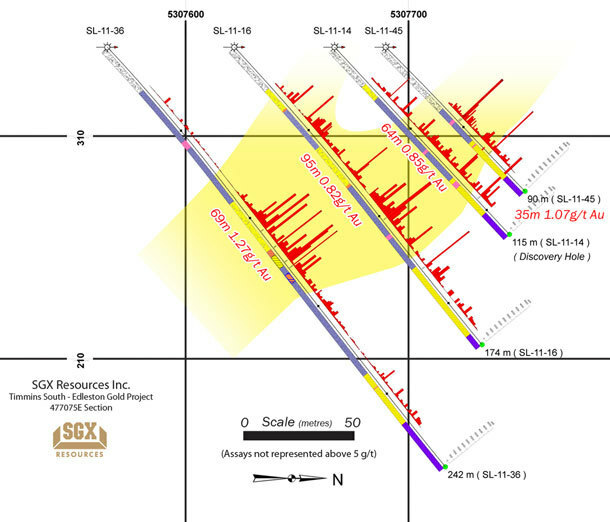 SGX Resources has undertaken an extensive diamond drilling program on the Timmins South property in Sothman Township since September of 2011 as a follow-up to geophysical targets with the objective of locating near-surface gold deposits. This land package is located approximately 60 km to the south of Timmins, Ontario, between the Young-Davidson mine to the east and the Cote Lake deposit to the west. 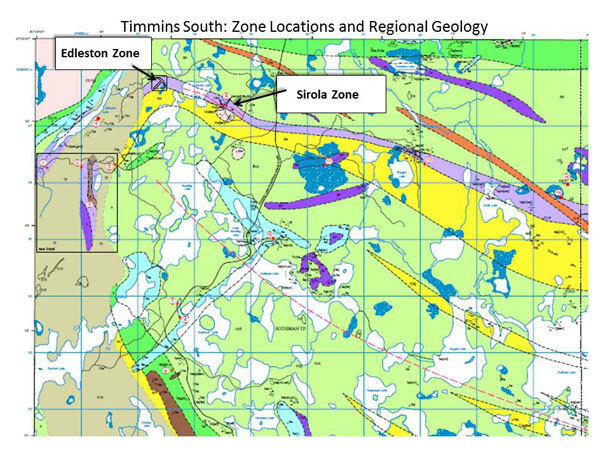 The Timmins South project is currently focussed on the Edleston Zone, located in the northwestern portion of Sothman Township. The zone has been extended to more than 400 metres along strike and to a depth of more than 200 metres. Regionally, this property appears to lie along the potential western extension of the Cadillac- Larder fault zone along which a number of major gold deposits are located. The host rock is an altered and sheared ultramafic that exhibits extensive silicification and contains quartz-carbonate in veins, veinlets and fracture fill. Mineralization is broadly distributed throughout the unit as pyrite in amounts of 3 to 5 percent with trace chalcopyrite and occasional visible gold observed as well. Additional intercalated volcanic and meta sediment units lie to the north and south of the deposit, large felsic and mafic intrusive units are in contact with the northern volcanic rocks to the east beyond the SGX property boundaries. 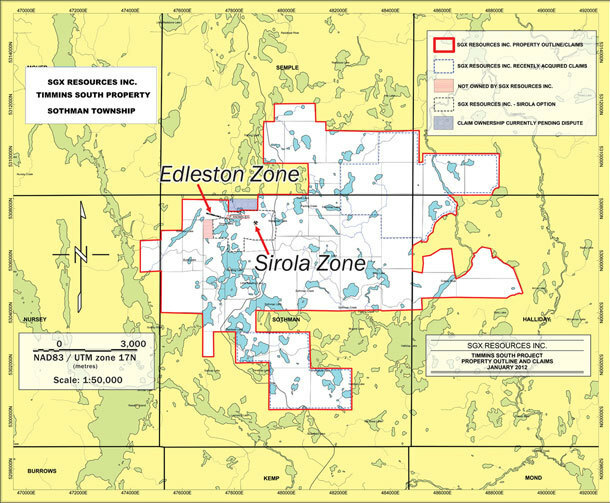 Along strike to the east of the Edleston zone by approximately 1.5 km lies the Sirola Zone, which exhibits similar geology and mineralization and contains some of the only outcropping in the region. The outcropping portion of this property consists of an altered reddish feldspar porphyry which lies in contact with mineralized ultramafic volcanic. These formations have a general strike of 100 degrees azimuth with a steep dip and are generally sheared and highly altered by carbonatization and silicification. Numerous trenches and test pits, believed to be from the early 1980's are also located on the property. 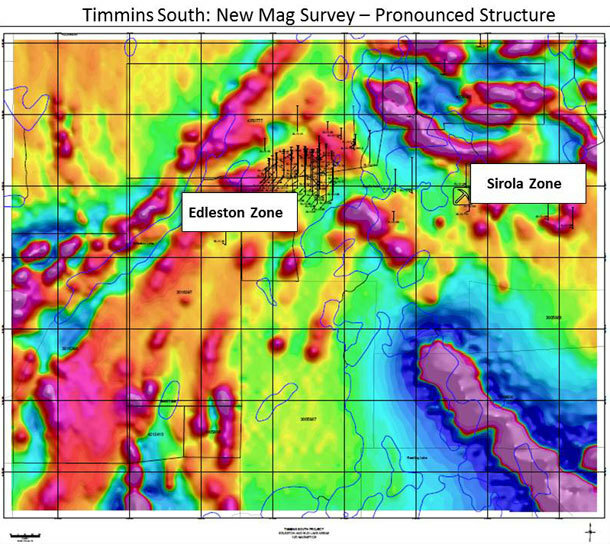 Geophysical anomaly drilling for vein-style gold targets intersected what is now known as the Edleston Zone with drill holes #SL-11-14 and #SL-11-16 in late 2011. This discovery is located in the north-west quadrant of SGX's claim group within the Sothman Township and has road access via Pine Street extending south from Timmins. The deposit dips moderately steeply to the south and strikes roughly at an azimuth of 100 degrees or east-southeast. Over 50 drill holes have been completed to date along 50 metre spaced sections, outlining a mineralized zone approximately 100 metres wide and over 500 metres long to a maximum depth of 150 metres while the zone continues to remain open in all directions. Recent geophysical and geological work has demonstrated that the Edleston Zone sits within the north limb of the host unit/horizon that stretches over 10 km to the east. This unit is broadly folded back toward the south and east immediately to the west of the deposit continuing under and near the contact with shallow sedimentary cover. Pronounced axial planes extend across the folded host unit. 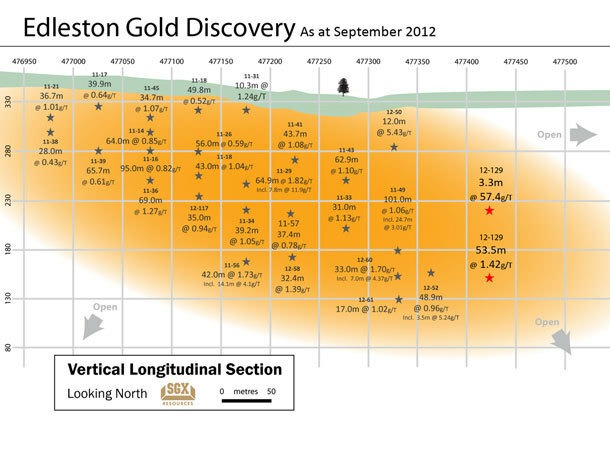 Assay values within the zone appear to be distributed in a relatively stable fashion with the exception of an occasional high value due to the presence of visible gold. The intersections above are near true widths as drilling has taken place from surface hangingwall positions, intersecting the zone nearly perpendicular to its strike and dip.